What is a backflow device and why do I have to have it tested annually? A Backflow device is a valve that only allows water to flow in one direction preventing the potential of a reversal of flow. In other words this valve allows the water purveyor to give you water but does not allow that water to come back into their system. Due to the fact that the water purveyor is responsible for the quality of the water that they serve and the fact that they dont know the quality of your water or the potential of pollutiants or contamination that might be in your water system state law requires that you the customer must have your backflow device tested a minimum of once a year to make sure that your backflow device is working properly. 1.) 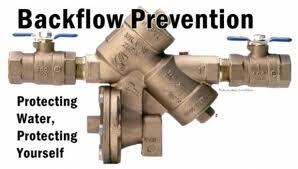 Back siphonage: Is backflow resulting from negative or reduces pressure in the water supply piping. Main breaks and excessive high fire flow can cause back-siphonage to occur in water mains. Example- The fire Dept opens a hydrant full open down the street from a chemical plant causing reduce pressure in the main pipe in the street. With out a backflow device protecting the water connection between the chemical plant and the water agency there is a potential that the potable drinking water could be contaminated with chemicals from the chemical plant. We offer all types of backflow services and a complete variety of backflow devices and parts for your backflow needs. We are certified in six southern california counties,LA,Orange County,Riverside County,San Bernadino County,San Diego County & Ventura County.We offer professional and same day or next day service.